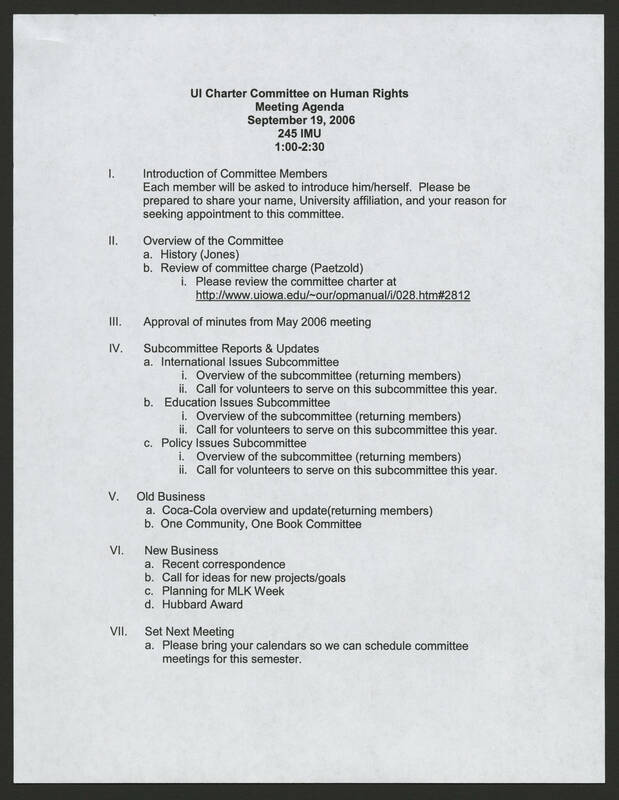 UI Charter Committee on Human Rights Meeting Agenda September `19, 2006 245 IMU 1:00-2:30 I. Introduction of Committee Members Each member will be asked to introduce him/herself. Please be prepared to share your name, University affiliation, and your reason for seeking appointment to this committee. II. Overview of the Committee a. History (Jones) b. Review of committee charged (Paetzold) i. Please review committee charter at http://www.uiowa.edu/~our/opmanual/i/028.htm#2812 III. Approval of minutes from May 2006 meeting IV. Subcommittee Reports & Updates a. International Issues Subcommittee i. Overview of the subcommittee (returning members) ii. Call for volunteers to serve on this subcommittee this year. b. Education Issues Subcommittee i. Overview of the Subcommittee (returning members) ii. Call for volunteers to serve on this subcommittee this year. c. Policy Issues Subcommittee i. Overview of the subcommittee (returning members) ii. Call for volunteers to serve on this subcommittee this year. V. Old Business a. Coca-Cola overview and update(returning members) b. One Community, One Book Committee VI. New Business a. Recent correspondence b. Call for ideas for new projects/goals c. Planning for MLK Week d. Hubbard Award VII. Set Next Meeting a. Please bring your calendars so we can schedule committee meetings for this semester.